A neon pink rabbit greets visitors at the entrance of Steamboat Springs’ Old Town today, just as it has done since 1952. For a long time, though, it got no respect. The Colorado Highway Department demanded it be removed because it was in the way of their plans to widen U.S. 40. At one point, the sign was proclaimed tacky. Ultimately defended as nostalgic, the cartoon-like image still stands outside Rabbit Ears Motel today. The controversial sign was declared a local historic landmark in the early 1980’s, and in 2002, it will be eligible for statewide historic designation. Throughout the 1960s, Lincoln Avenue was ablaze with dozens of huge, flashing neon signs. There was nothing to stop a merchant from putting up signage large enough to block out his competitor’s sign. In the 1970’s, the city stepped in to take control, prohibiting signs on or overhanging sidewalks and restricting their height and size. There could be no more blinking or animated features. Off went the rabbit’s flicking eyes. 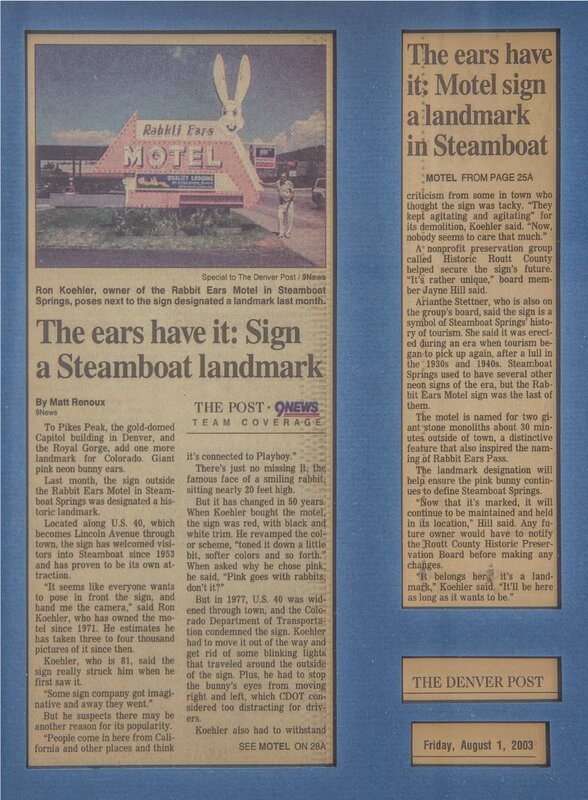 Only three signs from that era remain: El Rancho, The Space Station and Rabbit Ears. “At least two or three times a day, I see people out there, having their picture taken next to the sign,” says motel owner Greg Koehler.